New York Yankees right-hander Dellin Betances received a cortisone injection Saturday for a bone spur behind his pitching shoulder and is expected to be out six to seven weeks. Team physician Dr. Christopher Ahmad told the 31-year-old reliever that he should not require surgery. "I've had it since 2006, and Dr. Ahmad told me that with this shot, I could pitch the rest of my career and not feel it again," Betances said on MLB.com. "Obviously, that's a relief, and I can't wait to get back. I believe everything's going to be right and will just take this time to get ready and not rush things." In mid-March, general manager Brian Cashman said an MRI revealed a right shoulder impingement after the club was worried about Betances' velocity this spring. It wasn't considered a serious injury at the time, and the pitcher said, "I'm not concerned at all." 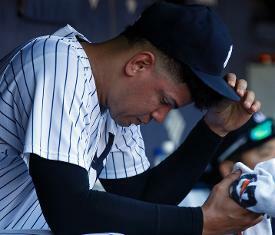 Betances struggled in a simulated game on Thursday, leading to another MRI exam, Cashman said. "It could have been much worse news," Cashman told reporters. Betances will go three weeks without throwing and will aim for a return to the New York bullpen in late May. Betances is a four-time All-Star who went 4-6 with a 2.70 ERA in 66 appearances last season, mostly in a set-up role for the Yankees. He is among nearly a dozen Yankees on the injured list. The latest addition was catcher Gary Sanchez, who went on the 10-day injured list on Friday with a left calf strain.